We are a 5 year old professional photography services company, specializing in Bridal Portraits, Catholic Wedding, Tamil Wedding, Bengali Wedding, Gujarati Wedding, Rajasthani Wedding, Punjabi Wedding, Marwadi Wedding, Reception, Engagement, Pre-wedding Shoots, Couple Portraits, Indian Wedding, South Indian Wedding, North Indian Wedding, Buddhist Wedding, Jain Wedding, Sikh Wedding, Muslim Wedding, Hindu Wedding, Parsi Wedding, Christian Wedding, Candid Wedding and Wedding photography. We offer products and services such as Documentary, Promo Videos, Cinematography, Shortfilms, HD Highlights, Poster, Frames, Enlargement, Photobook and HD Videos. We accept customized photography requirements. Our studio is in Jaipur. We cover events in Rajasthan and All Over India. We are comfortable communicating in English and Hindi. Most importantly their energy and involment for the work. I must say they are phenomenal and really master of their work. We hired them for our wedding and they really made it beautiful through their art and perfection on cameras. Supered Job. Thanks dear Unicorn.We have hired unicorn studio for the wedding. they were brilliant Photographer, Professional & Friendly. i would like to say for them that "Photographer open the door of past but they also allow look in to the future".Best Wishes for Unicorn. I called for my brother marriage this year in gurgaon. Pre wedding shoot was very good, creative. This team has great ideas to shoot videos. Great job guys ???? I have called them for my brother in laws marriage this year in alwar. This team has great potential, pre Wedding shoot was really amazing. This team simply did a great job. Nice job....was dubious at first but when got my brother's wedding photographs, they were so awesome, that I will recommend it to my family and relatives. We have hired unicorn studio for the wedding. they were brilliant from start to finish. Professional, efficient, friendly and, most importantly, took the most fabulous photographs of the wedding. Photos tell the story and bring back every feeling from our wedding day and we look at them feeling laughter and tears. I would thoroughly recommend unicorn studio. We hired them for my brothers wedding. This team has done appriciable work. It was nice to see that they are very punctual. They are definitely recommendable. I hired the Unicorn studios on a recommendation from a friend and I am so happy that i took his advice. The photographers were well mannered and calmly listened to my reqirements and quoted a decent price. I asked them to focus on candid shots a bit more and that is exactly what they did. Plus the quality of almost every photo was extremly good, probably because they used so many tools alongside the camera. In short, The photos were reallly good and I did not encounter any delays in reiceving the print and digital versions of the photos. Took services for my wedding.. Results are pretty awesome .. The angles used for pics were innovative and new. These guys went out of the way helped us with the styling and clothes selection for the pre wedding shoot. Similarily we asked them to use the Backdrop in accordance of the Wedding theme and they provided it. These small things tells alot about the commitment they had towards their clients.. It was first time in my family that we contacted a proper studio for our event. Their photographer was amazing. He was creative and he made everything look fabulous. From ethnic to candid, he covered every moment gracefully. We have a nice collection of memories. Colors in their photos look vibrant and that makes us happy whenever we look at them. His behaviour was nice that made us feel comfortable.He has a nice understanding too, without interrupting too much he took some really nice photos of everything. Experience with THE UNICORN STUDIOS was super exciting. Guys are really creative and 100% commitee to there job. I love the way these people are committed to do excellent job and I never felt that this are providing some services.instead at point guest were asking me if they are my friends as they were so into it.and hence best work actually reflect in the outcome as well. I am really happy that I choose them and I can guarantee that I could not have found better guys then them. Thanks you Unicorn studio for your services. I am happy with the commitment, professionalism and vali for money service. Main unicorn studios Ka tahe dil Se shukriya ada karna chahta ki inn logo ne Meri shaadi main bohat hi achi photo click ki.. very talented team,loved their work. Thank you Unicorn Studios! 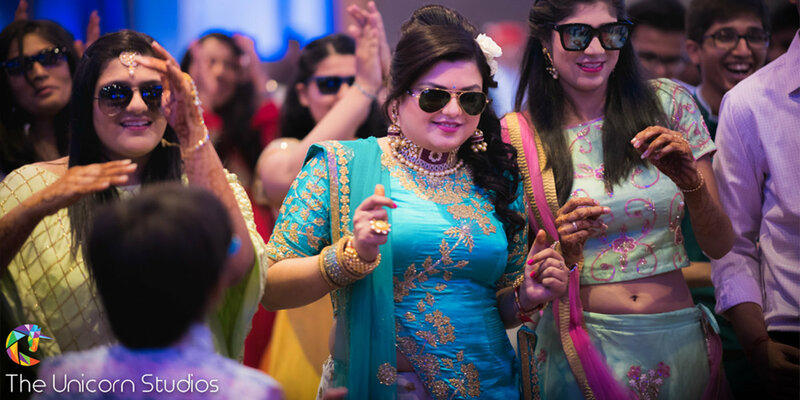 It was a marvellous experience coordinating with you people in the wedding The photographs clicked in the wedding were amazing, not only the bride and groom, but everyone is so happy to see themselves in your lens. Good luck to the company for future endeavours. Special thanks to Mr. Kushal Rawat for a wonderful and excellent work. I have booked them for my cousins marriage specially after a strong recommendation from one of my friend and i must add here that they gave us a complete refreshing experiance of photography. They captured lovely memories with perfection at every stage. Loved thier work, creavity and style. They all are amazing. I wish them all the best. I hired them for my marriage... They are so damn professional everyone including me loved their work so much. Me and my husband are so happy by our beautiful candids taken by them. They were great. I couldn’t express my joy after seeing the photos. The photos were fabulous and so were the photographers. I was really delighted after seeing the photos and I will book them only for the future functions in my family. My experience with THE UNICORN STUDIOS has been really great. These people have given the best serive I could have find in my entire city. The behaviour n the serive of the studio members was really nice . These people are really creative n do the work with full authenticity . Everybody in my family loved their work n would recommend to all others. The quality of photos were too good n all the work done by them was very beautiful. The money value was worth the service given. The photographers are really skilled jn their work, they were hard working and were full with enthusiasm. It was great getting serive from them. Satisfied and really Happy. Fantastic work by these people. After seeing their work, i came to know that Photography can be so interesting and creative. I strongly recommend them. It was a pleasure to have the unicorn studios at our wedding. They were fabulous especially in the candids. All the family members were mesmerised with the photos and everyone asked for the photographers as they wanted the same photographers in their weddings. It was my wedding on 18th of Feb 2017. Studio was hired for 2days. Poori team ne bhut Shi kaam Kia and they were active all the time and they took their job very seriously as they know shadi life me ek Baar Hoti h and they made it memorable for life. It was so cool. Those were probably the best photos somebody has ever taken of me. He was also ultra friendly as well chill person,he didn't mind the extra wait some of silly friends made him do. Superb experience. Talented people. Felt great. A real value for money. Thank you guys for giving us such great memories. Really nice working with you. I had fun. You people added personal touch which was really amazing thing. They are best, they knows everything, they provide you the result that even you won't expecting, their equipments are new and upgraded and i must tell you about their friendly nature. I must thank them for my Wedding photographs... clicked by miss. Samixa rawat and team. Their team is very professional and energetic. I loved the way they worked as a family member too. Thanks and all the best for the future. I believe that capturing beautiful moments perfectly at an appropriate point of time so that we can cherish them in the form of snapshots is a noble job. And I feel the team of Unicorn Studios is a master at this art. There professionalism, creativity and finnese is commendable and therefore I highly recommend them. Normally I don't write reviews, but these guys are good! Actually, I see their passion for what they do and it was seen when they sent their photographers to our wedding. All pictures were wonderfully shot. They are very sensitive to any queries we raise very responsive and I would recommend them to all I know. I hired The Unicorn Studios team for my wedding photography! They were very accomodating to the different pictures I wanted to have taken and they came out amazing. Very happy with choosing them and would recommend them highly! The team captured the important moments of my cousin in a very unique and totally natural way.They are highly professional and proactive with a wealth of experience.I want to recommend their services to all. Sagar and Kushal are very creative, with quality work. Their work was great. They made the simple event into memorable by clicking great moments. Will recommend them to others also. they did a wonderful job at my brother in law's wedding.Very creative and and captured each and every memorable moment beautifully and artistically.Their work stood out by a mile.They provided us the best service and gave us the best experience. Unicorn studios is One of the best wedding photographers out there. Absolutely loved the quality of the photos i received. Glad to have hired the team for my event. Would easily recommend this to anyone. Young & Creative Team. End to end solution across category. Customisation possible as per budget. Keep focus on quality & creativity (no compromise here) as a differentiator & target those who don't fall for best and cheapest. Create a Niche segment & People won't mind paying extra. All the Best ! Are bhot bdiya photos click kri h BC mja a gya me to yehi kahunga k bulao to inko hi bulao. Dil khush kr diya. Mere bde chacha ki shadi me bulaya tha mene inhe. Mere ek friend ne mujhe suggest. Photography me kushal ki sari team ayi thi. They came in my brother's wedding . It was really a great experience with them . They are highly professional and made our memories more beautiful . They are the best !! they are creative, with quality work. Excellent team which is very vo-operative and understanding. They make simple things look amazingly beautiful. Creativity at its best. It’s value for money. Unicorn team did the fantastic job in my sister's wedding. These guys are friendly n gud at their work no need to instruct them every time they take the best shoots. Wonderful team n work. Thank you guys. They are our family photographers and must say that they are simply expert in what they do. Every time they come up with the new ideas and new creativity. Great work. It was my younger brothers marriage. I remember those days pre wedding shoot was new in market, and these people did that really nice. When it displayed at marriage garden, everybody liked that very very much. Photographs and videos was too actually candid. I personally recommend them. The unicorn has excellent team of highly professional photographers. I am satisfied with the delivered photographs and shoots. It was a nice experience. All the best to unicorn team for the future. They are really good in photography. We booked for my nephew's wedding. My nephew has come from. China for his marriage and wanted a good photography. Yesterday they delivered all videos and photographs on our urgent requirement . I must say they really did a great job. Booked the unicorn studios for my younger brother Dr. Aashish pre wedding and wedding shoot held at Jaipur. They are very good in there work and did a good job. 5.0 Catherine We had so much fun getting my sister's engagement pictures taken by them. they were professional, creative, talented,and so easy to work with. They all turned out beautifully! Each picture perfectly captured the emotion of the day! You will absolutely love your experience with them. They are worth a try ? The team was very friendly and corporative. It was a nice experience. They delivered the quality work. It was a right decision choosing them. Thank you guys! These guys are great at what they do. Amazing experience without any hassle. They don't leave any space for doubts or questions. Professionals with whom you would want to work again. Its all words of praise for them. Overall it was an extraordinary experience. The artists sent to carry out our event was good in their skill set. They made our event memories irreplaceable by capturing the true colors and emotions associated with each ceremony. A wedding is a bond of two families and that bond was laid out in black n white (pictorial way) in the most perfect form possible. The use of professional equipment s and the delivered output won my heart. I would highly recommend them, they will definitely make your ceremony priceless by giving you the best shots of your euphoria moments. I so grtful n thankful to unicorn studdio for taking my family pictures my relTive pre wedding photoshoot . Unicorn studio its d best studio ever in jaipur keep it up n grt work of all.. Beautifully crafted, creative photography with professionalism and expertise shown in every click. It was not the moments you captured, it was our memory. Looking forward to see you guys again. They are value for money and really really good .. i hired them for my brother's wedding last month .. and they were quite creative and they know how to work.. They are the best, their equipments and gears, their unmatchable skills, their extraordinary thinking, you will get everything that you want, and i am so happy from their services. It was a pin drop silence and everyone was mesmerisingly gazing at the LED screen. This was the scenario of my sangeet venue when my pre wedding video was played. Samixa ma’am is genius behind the Camera. Me and my wife had a great experience . Hired them for my sister's wedding. We are entirely satisfied with their services . They delivered what they promised. Initially my parents were not ready because of their price . But I insisted and now whenever we see the album they thank me every time. called these guys for my brother's wedding. They certainly know how to do their work well. The pictures were really astounding and displayed massive talent inside these photographers. 10/10 will choose them again in future. It was one of our best decisions to choose The Unicorn Studios as my brother's wedding photographer. What can i say other than perfection! Not only did the pictures turn out beautiful, but also their team was absolutely amazing to work with. Even though months have passed since his wedding, on seeing these photos it all comes alive! Great work! Thanks! I'm immensely delighted to be sharing here a feedback for such a talented n ace-class professional photographer..Mr.Kushal Rawat. From seizing a perfect shot to being so cooperative... and from putting in their soul dedication to turning the pictures out to be their best...full marks n applauds for the whole team. The way every click had been captured n so creatively artified...i mean all those who've seen the albums are craving for their contact details from me. So yea... your work's speaking boys. Definitely worth recommending..and with no second thoughts..its actually a team worth every penny. Keep up the good work going guys. It's been more then 6 months of my wedding but even today whenever I see my wedding album and videos, I feel goosebumps . I cherish and relive all the memories of that day with every picture. All thanks to the team led by Miss Samixa Rawat of Unicorn Studios. They all were highly professional , well trained and well behaved. Every penny that I spent was worth it .Thank you very much for this lifetime experience and best of luck for the future . Your message was successfully sent to The Unicorn Studios. The Photographer may contact you soon.